The proposed site for the Chittenden County Transportation Authority’s long-awaited transit center seems to offer few downsides. 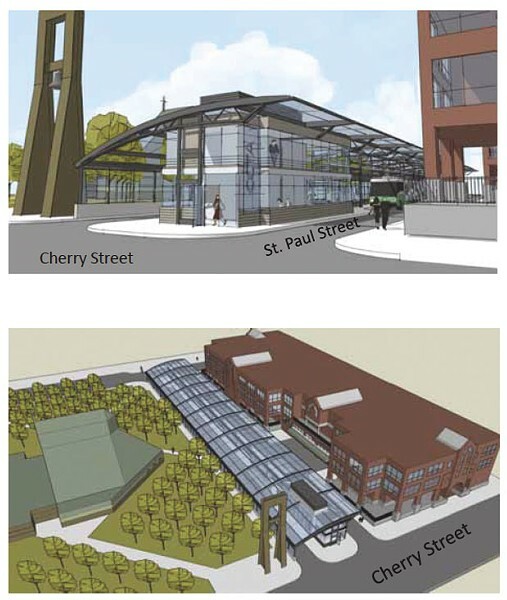 Spanning St. Paul Street between Pearl and Cherry streets, the bus-exchange site is within the downtown business district. 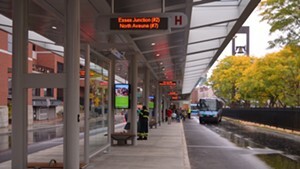 Buses entering and exiting the center will no longer have to cross Church Street. No tax-generating property will be lost. And CCTA’s growing ridership will finally have an enclosed, heated station after a nine-year search. But one group deeply regrets the choice: preservationists. The proposed site would encroach on a grid of trees designed by Dan Kiley, one of the most renowned landscape architects of the 20th century, and a Vermonter. Kiley, who lived and worked in Charlotte for most of his long career until his death in 2004, designed the grounds of the Gateway Arch in St. Louis, the Louvre in Paris and hundreds of other projects, often in collaboration with such iconic modernist architects as Eero Saarinen and I.M. Pei. With a steady stream of large, international commissions, he executed relatively few landscapes in Vermont. Aside from a grove at the University of Vermont, the state’s only remaining Kiley creation is the grid of locust trees on St. Paul Street, completed in 1977, which surrounds three sides of the Cathedral of the Immaculate Conception. The transit center plans call for removing the easternmost row of trees, some of which are already missing. Technically, the site is already interrupted by six waiting huts that the CCTA constructed along the east and south borders of the church grounds over the past year. Those are made mostly of glass, as the proposed transit center would be; the choice is an effort to preserve a view of the park for approaching pedestrians and to be “respectful of the architecture,” says Aaron Frank, assistant general manager at the CCTA. Frank enumerates the challenges that CCTA overcame before settling on the site: selecting 37 possible sites within a vibrant downtown district with few unused spaces; paying consultants $303,174 to design a conceptual plan for each site; holding 62 meetings with every possible stakeholder; and narrowing the list of contenders down to nine, and then to one, in a process that lasted more than a year. This was the third try. Two former searches for a hub site, run by the city rather than CCTA itself, ended in stalemates. In 2001, the Battery Street site now occupied by April Cornell was selected — only to be rejected in 2003, partly because riders preferred a site within the downtown business district. From 2006 through 2008, the city went through another selection process that focused primarily on the cathedral site and a Pearl Street site that houses the Vermont Department of Labor. When the city failed to prioritize the project, CCTA took over the search. Now that site selection is complete, the next stage of the process — mandated by the project’s use of federal dollars — is the National Environmental Policy Act review, which includes an assessment of whether the site has the potential to be historically significant. CCTA hopes to complete the NEPA review by the end of November. The key NEPA decision falls to a historic-preservation officer for the Vermont Agency of Transportation, and he or she is likely to declare the site historically significant, says Charles Birnbaum, founder and president of the Cultural Landscape Foundation, a Washington, D.C., nonprofit that raises awareness of important designed landscapes around the country. “It’s pretty much a slam dunk,” he asserts. Colman has submitted the Kiley site for the foundation’s annual list of at-risk landscapes, called Landslide. Says Birnbaum, getting on the list “can lead to designation [on the National Register of Historic Places, or the more selective National Historic Landmark list] and protection,” though the NEPA reviewer needs no such listing to find a site potentially historically significant. According to Birnbaum, Kiley is on par with Frederick Law Olmsted, the other major landscape architect the U.S. has produced. While the 19th-century giant instituted the practice of designing landscapes that looked natural — Vermont is lucky to have an example of his work in Shelburne Farms — Kiley sent the field in a whole new direction in the 1960s with his signature geometric arrangements, which gave trees an architectural presence. “All of the big landscape architects today — Andrea Cochran, Tom Oslund — bring a geometry to design that was very much influenced by Kiley,” Birnbaum notes. The cathedral site is a small but representative example of Kiley’s style. Its significance, notes Colman, also lies in how it relates to both the cathedral and the surrounding city. “It wasn’t just a case of ‘build the building and then find a landscape architect,’” Colman explains. Kiley, who was also an architect, worked closely with the cathedral’s architect, Edward Larrabee Barnes — another modernist master — to integrate the aesthetics of building and landscape. He chose locusts because their height subtly complemented that of the church, leaving its central tower to rise like a surprise beyond their screen; and because their leaves and bark matched the structure’s green- and brown-glazed brick tiles. He arranged the trees in a diagonal format, with paths leading to and past the church entrances, to foster an experience of calm for city pedestrians on their way elsewhere. 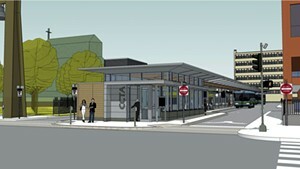 View plans for the transit center at cctaride.org.